Here is another Halloween creation. I made a bunch of these cards for my nieces and nephew (and other family members) for Halloween. 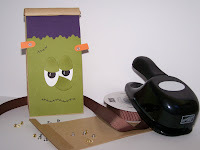 I am not a big fan of Halloween, but I do like to participate with cards and candy. I used my favorite Halloween set Boogie Eyes....so cute! I absolutely love this little spider (btw, I hate real spiders). 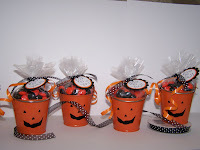 I found these cute little pumpkin pails at Target (in the dollar spot), they were 2 for $1. I am always on the look out for cute/inexpensive gifts, and these fit the bill. They are filled with m&m's...yummy! I made a bunch of these for the Hospitality Team at my church. I like to give each of them a little something for their dedication to the ministry, and it is fun for me. I really miss doing this kind of stuff with my kids (they are too big), so I find little ways to implement my need to be creative. This year I am heading up the Operation Christmas Child Shoe box ministry (Samaritan's Purse) at our church. If you have not heard of it I urge you to check out the website here this ministry was founded by Franklin Graham, and it is changing lives all over the world. Our family has participated in the OCC shoe box ministry for several years. When we were living in Lynchburg, VA is where we first hear about this ministry. Mike was a full time college student and we both worked to make ends meet. We certainly did not have extra $ to buy extra gifts, but I felt it was very important to teach Ashley and Josh about the true meaning of Christmas, so we decided to fill a box for a girl and a boy. That way Ashley and Josh could pick out gifts for their shoe box. We had so much fun trying to figure out what we would like to include in the shoe boxes, and we talked about the kids who might be receiving them. When you look at the videos of the children getting their packages, it is so awesome! It really makes you realize how lucky we are. If you are interested in filling a shoe box for a needy child you definitely will be blessed! There is less than 60 days until Christmas, why not start the giving now. check out the video link I posted to the left of my blog. It is always better to give than receive! then decided to bring out my au chocolate designer paper (love that stuff). after stamping the bloom in pink, I cut it out and popped it up on a pop dot to give it some dimension. I hope my friend likes it. 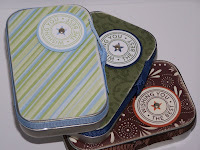 Supplies: (stampin up! 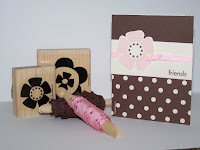 unless noted) big blooms stamp set, Papertrey (word set), chocolate chip cs, very vanilla cs, au chocolate dp, pretty in pink ink, chocolate chip ink, pink grosgrain ribbon. Here are the Halloween treats I am bringing in to work today...I like how they came out. 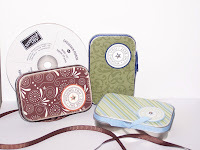 There was no stamping involved on this project...just punches, eyelets and scalloped scissors. I filled them up with (white trash mix) but I am calling it "Monster Mix". You may want to double this...It is really yummy! melt almond bark on low heat in a double boiler; stir frequently. Place chex, golden grahams, pretzels, pecans in a large bowl; once almond bark is melted stir into dry mixture, mix until coated. 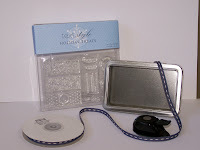 Place on a aluminum foil or wax paper lined cookie sheet and place in fridge to set. once hardened break into bite size pieces, add powdered sugar and toss to coat (you can do this in a covered bowl or zip lock bag). store in an air tight container. Look at what I got in the mail the other day...I am so excited to make something! You will have to check back to see what I created (the wheels are spinning in my brain, lol!). I ordered this stuff from Paper Trey Ink, I have several of their stamp sets, this one is Holiday Treats. If you haven't heard of them, check out their website here they have clear acrylic stamps, stamping accessories and lots of neat packaging items. I am really starting to like working with acrylic stamps, because I can see exactly where I am stamping (I just don't do very well with the stamp-a-ma-jig tool). 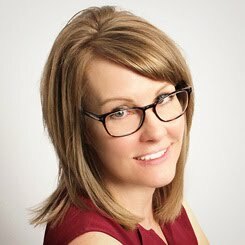 I have decided to take the weekends off from blogging...that way I have time to check out all the other blogs I love to read. I love cake! And what is better than cupcakes...an individual cake decorated with yummy icing and not having to share. 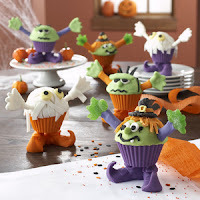 Since being on WW, I have had to limit my love for sweets, but I came across these at http://www.surlatable.com/product/556159.do aren't they the cutest? I keep it on the shelf in my craft room and look through it often...I love looking at pictures! I like how you can open it and prop it up and display two photos at a time. I am planning on making a few more of these for Christmas gifts...they are fun and go together pretty easily. Leave me a comment or send me an email if you would like the directions to make one. Here is a picture of the mini pumpkin bundt cakes Ashley and I brought to work for Bosses Day...I love pumpkin anything...pie, cake, bread, bagels, latte (at Starbucks), I am really getting into the holiday mood. Mix the pumpkin and eggs together well with mixer; add spice cake and mix until blended; pour into desired greased cake pan; bake at 350 for 40-50 min (this is for a large bundt pan) for a 13x9 bake approx 30 min and mini bundt cakes 20-25 min. Frost as desired (Cool Whip is a good choice, and super easy). 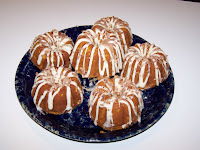 I used a cream cheese glaze for the mini bundts (sorry I don't have a recipe. 1/2 pkg cream cheese, about 1-2 cups confectioner's sugar, tsp vanilla, milk. I mixed the cream cheese and sugar together; then added the vanilla and milk until I got the desired consistency to drizzle over the cake: I shaved some chocolate over the top for a garnish (use potato peeler)--Enjoy! I liked these much better. Well my weekend just seemed to fly by, faster than usual...Saturday Ashley and I were on the go from 9:30 am until 4:00 pm. We started the day with breakfast at Einstein's Bagel's, we both love their holiday pumpkin bagels with pumpkin smear (aka cream cheese). Then we were off to Sam's Club to shop for supplies for church, and decided to run over to Bath and Body Works to pick up some of their oil (for our oil burners), they were on sale for $3 ea, that is a great deal...usually they are around $8. Then we went back to the church to unload supplies and then clean it. We were not done yet, then drove up to somewhere in Phoenix (Camelback road), to look at a discount mattress store she found online (side note, she is moving into her own place and needed a new bed), she did manage to find one at a really good price, and it was delivered yesterday. I am looking forward to next weekend, I think Mike may have it off (maybe he will re-install my shelves...(I am hopeful), so I can stamp away...starting to get the holiday stamping fever. 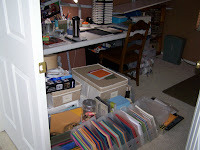 Thought I would attach a photo of what my craft room looks like right now...(it is a MESS), sorry I don't have any before pictures, but will definitely take some once it is back to normal. Ashley and I are driving to Scottsdale this morning, so she can look at a mattress and box spring for her new condo (she is moving in with a friend on Nov 1), then I am off to Sam's Club to pick up some church supplies, then clean the church, and then after all that I have to do my grocery shopping (YUCK! I really dislike grocery shopping, but we gotta eat)...not much time for stamping today, or anything else for that matter. I wanted to write a little something about my nephew, Nathan...last weekend he competed in a karate tournament and won 3rd place in a sparring contest (see him in action to the left, he is the blue belt)...way to go Nathan!!!! We are all proud of his accomplishment, best of all here he is with a picture of his shiny new trophy! And just in case you didn't know, October 16th is Boss Day, and I was nominated to make the cards for the bosses. It is hard for me to make masculine cards, (I like flowers, ribbon and bling)but I did the best I could, had to put ribbon on them though, lol! 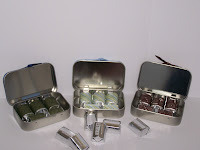 ...plus I made some matching tins to house the gift cards we are giving them. (can you believe it is already October? 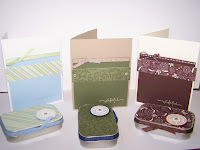 ), so watch for some more stamping projects. Josh brought home a guinea pig a few months ago (it was supposed to be a gift for someone, and he couldn't part with it), anyway, we all fell in love with it. Her name is Piper, but I call her Guinea. Ashley decided she wanted to have one of her very own and give Guinea a friend, so after weeks of hunting Petco, PetSmart, etc for another female guinea pig (females are hard to come by), she added Baby Gin to the family. Now we have 2 cats and 2 guinea's (that is enough!). They are great pets (and are not rodent like) . We decided to take them outside in the backyard this weekend since the weather was so nice. 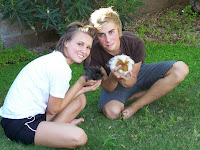 Aren't the guinea's cute? I think the peeps holding them are too! Sunday night Mike finished the kid's shower...It was so nice to clean the bathroom and put all the stuff back in its place. 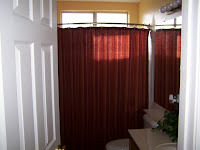 As you can see from the picture we installed one of those curved shower rods. When Mike asked Josh how he liked the new tub, his response was "I have so much room in here I could have a dance party" only from the lips of Josh! We all had a good laugh. I recently completed the online course by Jessica Sprague to learn how to digital scrapbook in Photoshop Elements. I really enjoyed the class. Each week you are emailed your assignment (as well as daily emails) to work at your own pace and the videos are available to you always. Here is one of the pages I made. Today is the sign up for the class Up and Running With Photoshop. 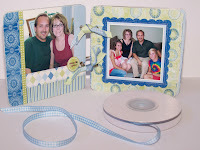 It is well worth the $ if you are interested in learing to scrapbook digitally. Did you make a card yesterday? I actually stamped! I will post a picture of my creations next week. check out http://pinkforoctober.org/ to learn more. Well let me just say that the past few weeks have been crazy! Mike and I decided to finally tackle the kids bathroom project (there was a crack in the shower wall and had to be replaced sooner or later). Mike had a few days off and decided it was time. so...he had some fun smashing and ripping out the old tub and surround, then off to Home Depot to buy the new stuff. Of course the new stuff didn't fit (smaller), so to make a long story short...this was going to be a much bigger job than anticipated...ARGHHH! Now it would have to include redoing the pipes and some tiling. Things were going along slowly but surely and then Mike found out that he was chosen for a job that was going to be 12 hours a day/6 days per week. so...the bathroom is pretty much at a standstill. He is working on it here and there and I am hopeful to have the shower working this weekend or next weekend (4 people sharing a bathroom is quite a challenge, to say the least!). 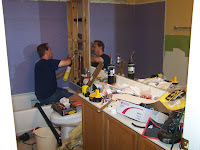 The rest of the improvements (vanity, mirror and lighting) will have to go on the back burner until this job is completed and he has a weekend or two to rest. While I was at work yesterday I got a call from Ashley around 1pm...it went something like this: "mom, you are not going to be happy!" What? 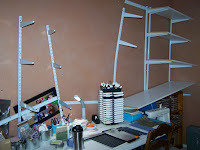 All the shelves in your craft room completely separated from the wall. WHAT?!!! OK, she was right, mom was not happy. 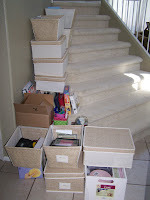 Everything was piled on the floor of my craft room. I ran home to check out the damage (Ashley had already started picking up stuff), I was so relieved that my laptop and camera (that were on my craft table under the shelving) was unharmed. One of the shelves made a tent over it and protected it. Thank you Lord! As most of you know I am a little OCD, so the unorganization around me is somewhat of a challenge! It will all work out...sometime!